If you’re lucky enough to be part of the underground network of pipes that delivers natural gas straight to your home, you should think about taking advantage of updating your heating system. New advancements in technology have made it possible for gas heating to be safer, more economical, and more customizable than ever before. Our skilled team of experienced technicians works to bring these possibilities straight to your home. Our company specializes in maintaining and replacing natural gas heating systems. And our staff is always courteous and professional. What different heating contractors consider to be a tune up can vary greatly. For our company, a tune up means that we check all the major components of your entire system. When we inspect your Heating system, we make sure to examine for blockages, leaks, gas combustion, proper ignition, faulty wiring, and clean filters. Only after checking the entire system during the preliminary inspection do we move on to servicing what needs to be serviced. Natural gas is already the most environmentally friendly fuel out there. It is the only fuel where the overwhelming majority of it is produced, transported, and sold in the United States. But now you can do even more to help out with your home’s carbon footprint. With a heating system that works properly, the byproduct should mostly be water vapor. When it doesn’t work properly, however, it will not use the gas as efficiently as it should. Instead of letting this happen to you year after year, put in the short time it takes to get your Heating system serviced. There are also economic benefits to getting a tune up for your natural gas heating. Besides emitting fewer emissions, a new gas heating system can save you money on fuel costs each year. Once your gas system is set to work optimally, it will also last longer. 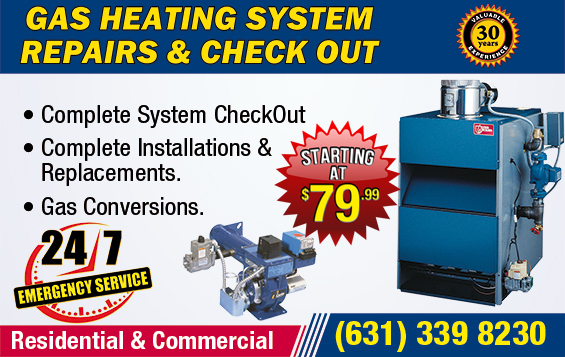 So call the leading Heating system provider on the island. We can take care of all your home gas needs. It is important to note that any home with a natural gas heating system should always have a working carbon monoxide detector. Also, natural gas is flammable, so please do not work on your home heating yourself unless you have received extensive training by someone who is knowledgeable in the field. Leave it to a Heating system professional who knows how to circumvent all the danger so that the machine can continue to operate safely for the duration of its lifetime. Having no heat on a cold day is the worst. If this happens to you, we treat it as a top priority, and come as quickly as we can. However, you can prevent this from ever occurring by having your aging Heating system maintenance or replaced. Using natural gas means that you won’t run out of fuel to heat your home. You don’t have to worry about scheduling the next fuel delivery or checking for an empty tank. Why not add to the convenience of natural gas systems by making sure it doesn’t break down on you in the middle of the year. Call us today so that we can tune up or replace your natural gas heating system. © 2019 Nassau County HVAC | Nassau HVAC. All Rights Reserved.